Does your dog love to chew? It's important to focus that energy on something positive, like chews and bones... but do keep in mind, all chews are not appropriate for all dogs. Disclosure: This post is sponsored by Pet Qwerks. 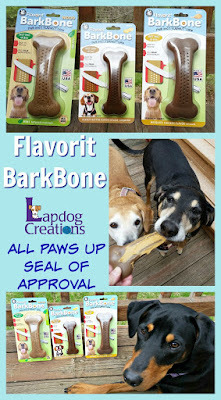 I am being compensated for helping spread the word about Flavorit BarkBones, but Lapdog Creations only shares information we feel is relevant to our readers. All opinions expressed here are my own. Pet Qwerks is responsible for the giveaway prizes. This post contains affiliate links. If you click on one and make a purchase, we may receive a few pennies to assist in maintaining this blog. With a mixed pack, we've had our share of chewers - from teething puppies to tough chewers, and everything in between. I've thrown away more chews and bones than I can count. Some were so flimsy the dogs were breaking them apart within minutes, while others were so hard, I was afraid of our seniors breaking their teeth. As I was approaching my wit's end, we were introduced to Flavorit bones last year and they were an instant hit with both the dogs and humans. Not only do the non-edible chews keep all three dogs entertained, but they really do hold up to our tough chewers. The dogs love the variety of flavors, while the humans love the fact that they are made in the USA. Now what if we told you there's an even better chew? 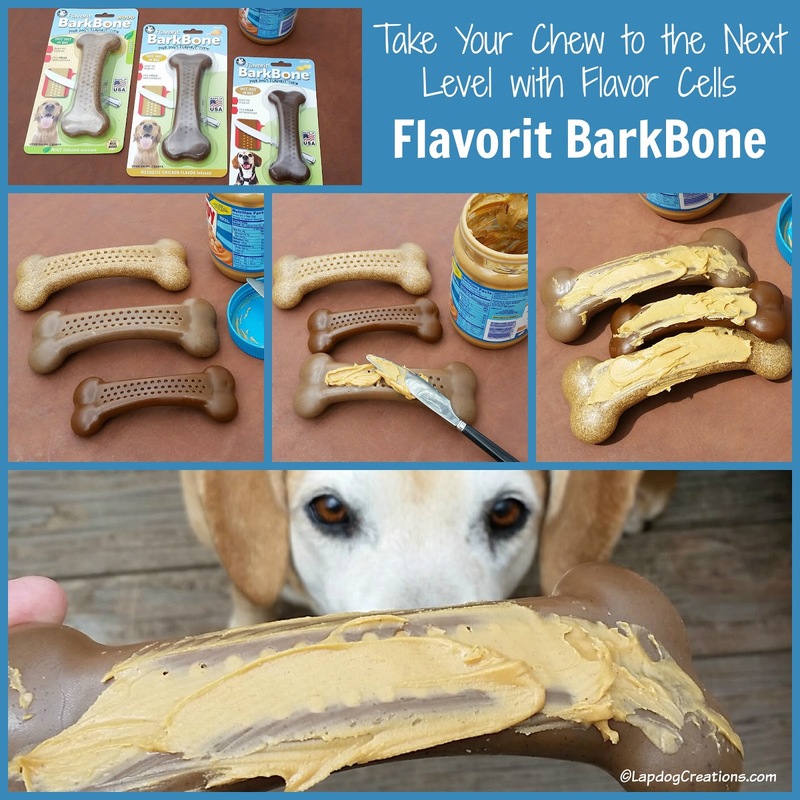 Pet Qwerks, makers of Flavorit, recently upped the chew game ante with the introduction of Flavorit BarkBone earlier this year. This "next generation" Flavorit is just like it's older sibling, except it has a hefty curved shape which makes them much easier for dog's to pick up, carry, and move around with their paws. 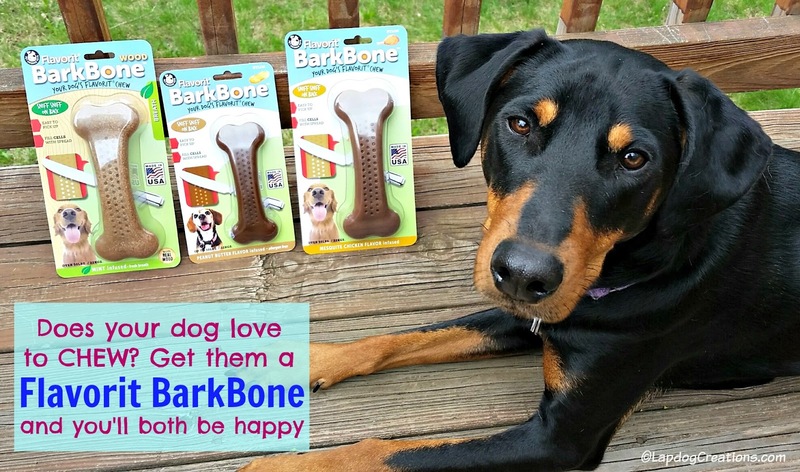 Having watched my dogs struggle to figure out how to pick up a bone that is flat on the floor in the past, I have to say the BarkBone design is pure genius! They no longer need to ask for their humans help or to bat the bone around until they get it propped up enough to grab it. The curved design also allows them to get all of the yumminess out of the flavor cells on both sides of the chew without making a mess or losing some of their tasty treat. If your dog has been lucky enough to enjoy a classic Flavorit bone, you already know about these magical little holes molded into the chews. They make Flavorit chews truly unique. Small and orderly, you'll find the flavor cells on both sides of the BarkBone. They are designed to be filled with your dog's favorite spread. Our go-to tends to be peanut butter, however the Lapdogs do love cream cheese and yogurt too. Pet Qwerks says the flavor cells help to satisfy our dog's need to forage, and I would completely agree. The Lapdogs work on their Flavorit chews for much longer than any other chew bone, and I find it quite entertaining to watch them as they figure out how to get every last morsel of the peanut butter out. If you're wondering about how you're going to clean the BarkBone with all those little holes, no worries. While my dogs do an excellent job cleaning them on their own, sometimes they do need a little extra cleaning. When this happens, I just toss them in the dishwasher (top rack only) or use a small brush and hot soapy water. Toothpicks also work great if you have any stubborn, dried-on food left in the holes. Each flavor is available in three sizes: Small 4.25" for dogs up to 15 lbs, Medium 5.5" for dogs up to 50 lbs, and Large 7" for dogs over 50 lbs. 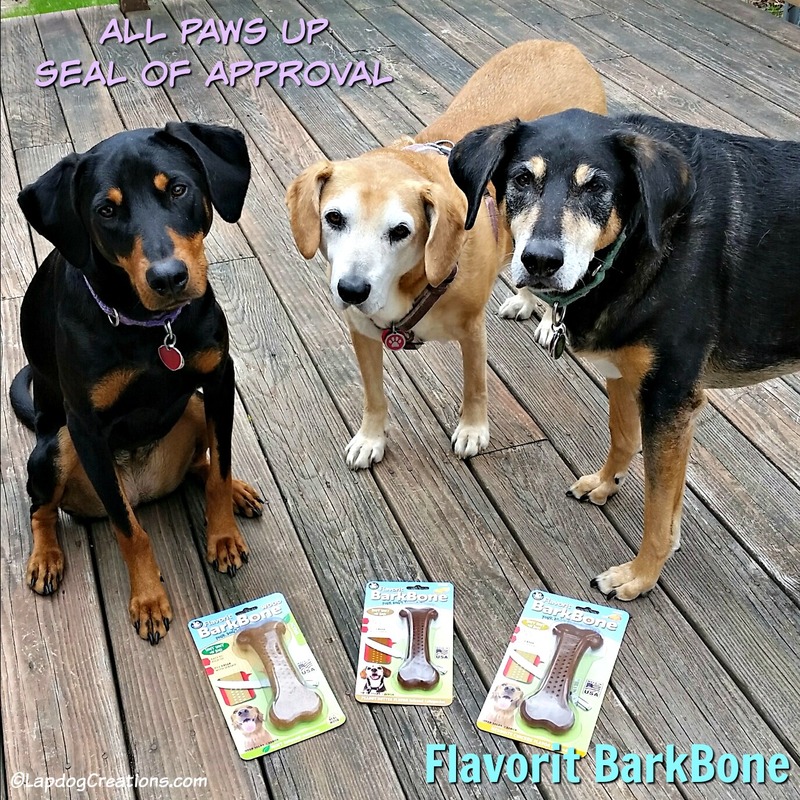 The Lapdogs give their all paws up seal of approval to Flavorit BarkBone and they're pretty sure your dog will too! 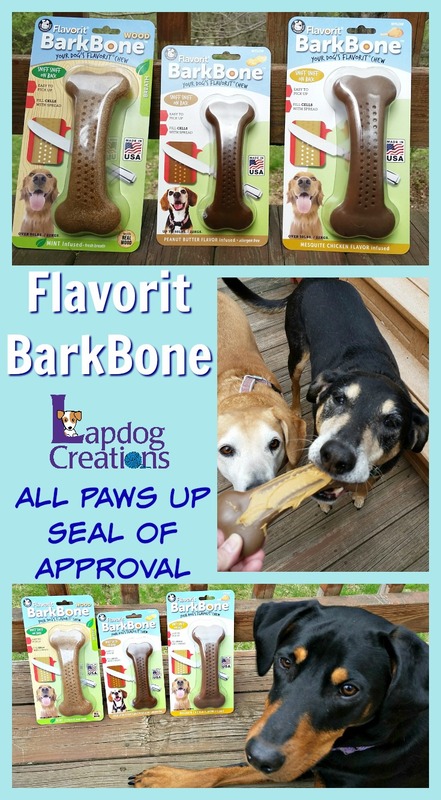 The humans give BarkBone two thumbs up and highly recommend that you pick one up for your chewing enthusiast today. Trust us -- it'll save your coffee table legs (seriously, nearly every one of our own dogs, as well as our foster dogs, has enjoyed those table legs... if only Flavorit bones existed 14 years ago). 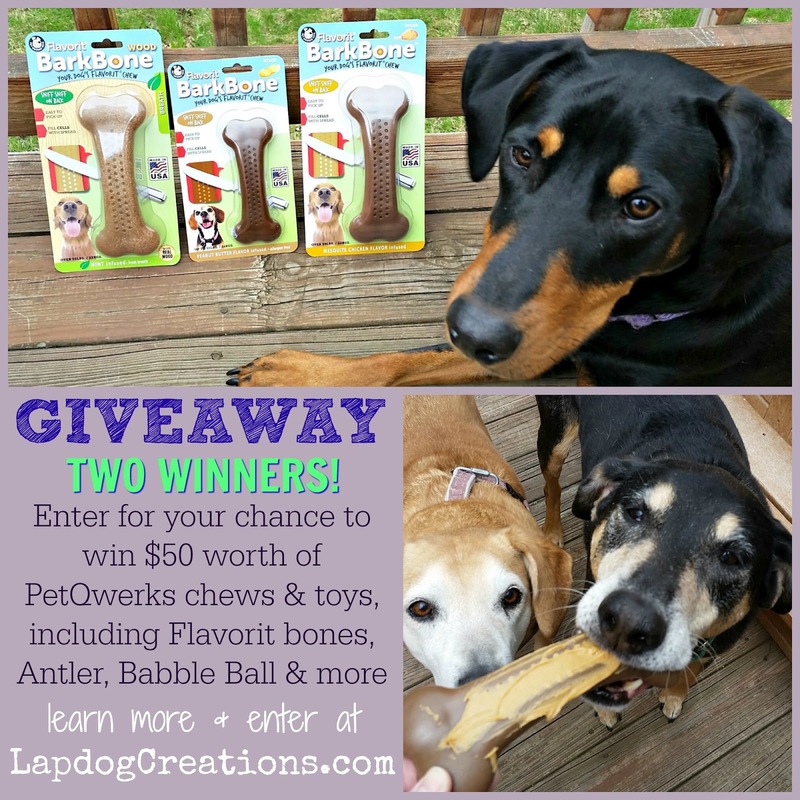 Thanks to the awesome folks over at Pet Qwerks, two lucky winners will each receive $50 worth of chews and toys (one each of Flavorit BarkBone, Nylon Antler, Flavorit Bone, Emoji and Babble Ball). My dog is a big chewer but he gets bored with things so I have to give him new bones, chews, toys etc. We've never tried Flavorit before and I bet he would love them! I like that they are dishwasher safe. Mackey destroys everything she can get in her yappy mouth. I wonder if these would work for her. I like the idea of the little flavor holes for spreading something yummy. That would probably hold her interest. I like that they are suitable for aggressive chewers. I like that they come in different sizes that's perfect for every dog. I'm always looking for a treat that has 'longevity' and won't be consumed in one gulp... all the better if we can do a bit of fetch with it!! Our dog loves to chew and we are always looking for healthy and natural choices for him! Thanks for sharing this! Lady Shasta while not such an aggressive chewer plus having had several teeth pulled, does stay with the chew for awhile. I just got another Beagle - a little Beagle, Miss Maizie - who is an aggressive chewer. Besides chewing on toys and tugs, she loves antlers. I think I have some grand-dogs who would love these! The bent bone is a brilliant idea! And I hope they appreciate your fine testers. Happy Monday, Nic and Lapdogs! What most interests me are the flavor cells that my dogs would enjoy getting all the stuffing out of! I also love that this chew would last awhile. Louie and Jill would love a peanut butter flavored one best, but really, as long as I can slather peanut butter on them (those holes are genius! ), they'd love any. What a great product! i love that it holds peanut butter! we are big peanut butter fans here! The flavor cells seem like a really great way to incorporate a bonus treat with these chews! My Chewy is a tough chewer, so I'm always looking for durable chews. I like that they are available in a variety of flavors and made in the USA. I'm interested in the unique flavor choices! My son is looking for a way to break his dog from chewing everything. I think these would work and his dog would like the flavor. I like the different flavors & choice of sizes.